The perfume of summer drifts across Darling Quarter’s Village Green as bands of family and friends relax in the warmth of the fading sun. With blankets laid out for a casual picnic, or an easy dinner from one of the nearby restaurants, the crowd awaits the onset of darkness and the glimmering starlight, ready to escape into another world and ride the crest of a cinematic wave at the Night Owls Film Fest. The fun kicks off each evening at 6pm, with a different entertainer every night to keep the kids fascinated, followed at 6:30pm by fifteen minutes of the best short films made for, by, and about children in the Little Big Shots festival. At 6:45pm the full-length family feature lights up the screen, and on Friday, Saturday and Sunday evenings from 8:30pm it’s the grownups chance to enjoy the free movie program tailored just for them. For more information and to keep up-to-date with festival news, follow Darling Quarter on Facebook and Instagram. January in Sydney: it’s one of the best times of the year. Summer’s arrival has grown from a whisper into a joyous roar, and long sunny days stretch ahead, bringing with them the sense that anything and everything is possible. 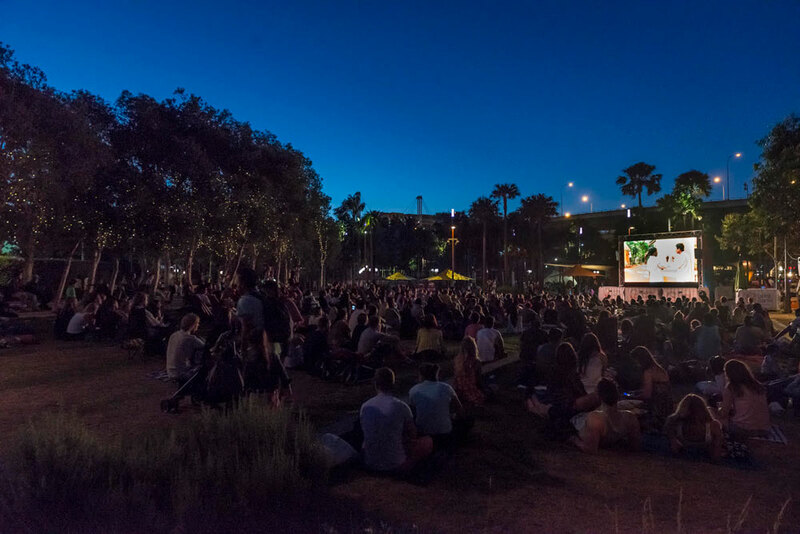 Fluttering in from another world comes the Night Owls Film Fest, ready to help Sydneysiders make cherished memories as they gather their loved ones and lay out a picnic rug on Darling Quarter’s Village Green. It’s a place of magic and creativity, where the wildest stories and most enchanted characters play out scenes like half-forgotten dreams, for young and old alike. No other event can echo the charmed feeling of a night under the stars, enjoying the type of screen time that brings people together, and the balmy summer nights that bring with them a freedom unmatched by other seasons. As the last of the wispy clouds scuttle across the late afternoon sky, and the velvety cloak of darkness slowly descends upon the city, movie magic drifts in on the warm evening breeze. Food, news and happiness gets passed around the contented crowd of families, some making the annual trip to Night Owls their custom for the past eight years. In the glow of the movie screen, smiles are softly painted upon the faces of children, and hearts are filled. The world is painted vivid by the transformative power of the cinema, where new worlds are explored, the gamut of emotions are tested, and escape from the everyday is made possible, if only for this one, dreamlike evening. Night Owls: where stories unfold. 6pm to 6:30pm Pre-movie Entertainment & Nat’s Fancy Faces Every Day!